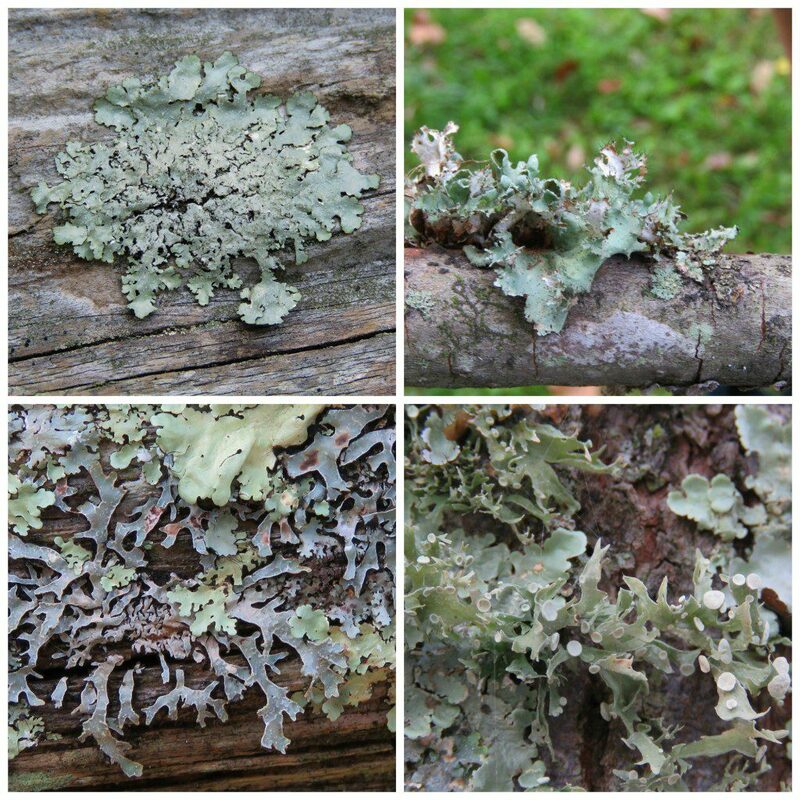 You are here: Home / Home Page / Lovin’ the Lichens! The 2016 VNPS Annual Meeting was a lot of fun; full of laughter and mingling with old friends as well as making many new ones. The highlight of the weekend for me was a Lichen Walk at Wildwood Park. To our delight only four of us joined Gary Cote for the walk, and we were joined during the walk by a friend of his who is a steward of Wildwood Park. Gary not only was knowledgeable and a good teacher, he was patient and entertaining. The first thing we quickly learned is that if you want to really see a lichen you’ll need a lens. There is so much more to them than initially meets the eye. Some of them have dust, spots, cups and other features that you need to be able to see before you can even begin to identify what you’re looking at. Happily, we saw almost all twenty of the lichens on the list that he provided. Lichens are a complex life form, a symbiotic partnership of two separate organisms, a fungus and an alga. Very recently new discoveries have been made, and now we know that some lichens have a third partner, a yeast. It’s a very cool story, linked below. Parmotrema hypotropum, (Powdered Ruffle Lichen), and Flavoparmelia caperata, (Common Greenshield Lichen), are both commonly found here in Virginia. When wet, the algae in Common Greenshield and other chlorolichens “bloom,” which means it turns a deeper shade of green. A chlorolichen a lichen that has a green alga for its photobiont . . . once you get into lichens, you have to learn a few new words! See below! My favorite of the lichens I saw was Parmotrema sulcate, (Hammered Metal Lichen). It was hard to capture the pounded metal look. The edges are squared off really reminding me of sheet metal. Finally Ramalina americana, (Sinewed Ramalina), reminded me of some place fairies would play. To me it looks like Staghorn Fern with Japanese teacups! Another interesting lichen is called a crutose. Crutose grows as stains, crusts, or is tightly appressed to the substrate. 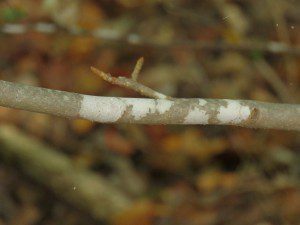 The Whitewash Lichen, (Phlyctis argena) is an example of this type; growing on the limbs and trunks of trees, it’s easy to see how it gets its common name. Finally, Sinewed Ramalina, (Ramalina americana), reminded me of someplace fairies would play. To me it looks like Staghorn Fern with Japanese teacups! How many times I must have passed by trees and rocks never noticing the interesting and diverse minutiae of lichens. I won’t make that mistake again. I’m going to start by learning more about lichens. 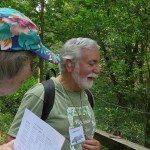 Gary recommended Common Lichens of Northeastern North America: A Field Guide by Troy McMullin; Frances Anderson published in 2014.